American Athletic Track and Turf is the Right Choice! With over 1000 installations since 1983, American Athletic is the definition of experience. Having won 10 national awards from the ASBA, your dream facility could be an award-winner as well. In business since 1983, we have seen trends come and go and are on top of the latest technological shifts. Bill Narozanick began working for his father’s company, Burlington Asphalt Corporation (BAC), in 1968. While his father’s company specialized in asphalt paving, it also did sport surfacing, which included running tracks, tennis courts, and other sport surfaces. Bill participated in all aspects of the services offered by BAC, accumulating a wide range of experience. In 1973, Bill was part of the Florida State University Track and Field team, where he studied the construction of Florida State’s state-of-the-art running track facility and participated in the first track meet using that facility against the University of South Carolina in 1974. At that point in time, Bill realized he wanted sports construction to be a large part of his future. After graduating college in 1979, Bill returned home and became a junior estimator and project manager for BAC. In 1982, Bill left BAC to start his own business with the sole purpose of constructing premier sports facilities. In 1983, Bill officially incorporated American Athletic Courts, Inc, which is the parent company today for the various company names we use to promote our services, i.e. American Athletic Track and Turf, Florida Track and Turf, etc. From the beginning, American Athletic’s focus was on all sports courts, natural turf fields, grading of cinder tracks, etc. Around 1989, it became apparent that the trend was for running tracks to switch from being cinder-based to synthetic materials-based, allowing American Athletic to position itself to be able to take advantage of this new trend. 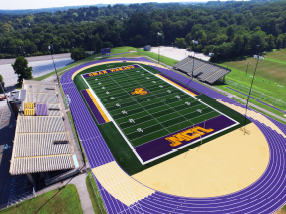 Early on, American Athletic developed a relationship with a company called Southwest Recreational Industries (SRI), which was soon to become the largest manufacturer and installer of running tracks and artificial turf fields in North America. American Athletic became SRI’s go-to site work contractor in our region and began to include latex surfacing as part of our services. 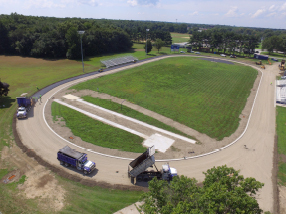 The trend of running tracks going synthetic catalyzed American Athletic to look into laser-controlled paving, which would help provide more precise measurements and output, becoming one of the first site work contractors to integrate those capabilities into our services. Since the early days of laser technology, American Athletic has been at the forefront in developing techniques to optimize production and maintain the highest quality for all types of sports facilities, including those facilities done with laser-controlled asphalt paving, which often result in the finest installations in the industry. In January of 2004, SRI filed for bankruptcy, creating a huge opportunity for American Athletic to continue offering their previous services, in addition to expanding into polyurethane service offerings. In early 2004, American Athletic became an authorized installer for the Beynon Sport Surfaces line of products. Also in 2004, because of FieldTurf’s innovations with artificial turf, artificial turf became much more affordable and popular as an option, spurring on mass interest in this new product line. Once again, American Athletic positioned itself to take advantage of this large scale trend, creating relationships with some of the highest quality turf manufacturers available, including FieldTurf, AstroTurf, Sportex, and Sprinturf, amongst others. 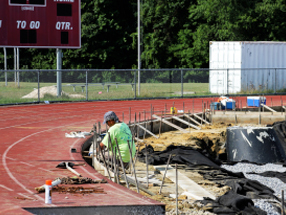 Today, American Athletic still regularly works with Beynon, Fieldturf, and myriad other engineers, project managers, and architects on projects in the Mid-Atlantic and Florida. The company is as forward-thinking as ever, looking to implement digital solutions to improve the quality of life of our workers, making submitting and reviewing timecards easier for them, while making job costing easier for the staff in the office. American Athletic has won 10 national awards from the ASBA and are looking to continue our streak of excellence by training new employees and expanding the regions we work in, as well as expanding the services we offer!